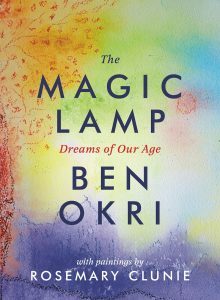 The Magic Lamp is an extraordinary collaboration between artist and artist – the Booker prize-winning writer Ben Okri and the painter Rosemary Clunie. Together they have created a world, and peopled it with dreams. Fairy tales for adults, these narratives are a response to our times, informed by our world but not limited by it, imaginative, enchanting, haunting – both prescient and prophetic. The original paintings, beautiful, playful, intimate and dreamlike, pull you in to a land of colour and vision. Both words and images grew together out of a long friendship and creative symbiosis. 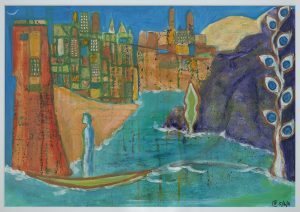 A special exhibition at Abergavenny Museum, showing until September 2nd features fifteen of these original works by Rosemary Clunie, and each is accompanied by the beginning of the corresponding story written by Ben Okri. In addition there are two prints that were specially created as further collaborations between the artist and writer – each combining a painting and a complete story from The Magic Lamp, to create a new image. Rosemary Clunie’s artistic collaboration with Ben Okri dates back over 20 years. Her paintings have drawn considerable inspiration from his many works of fiction, essays and poems. She has designed illustrations (unpublished as yet) for several of his books. Their latest project, The Magic Lamp (published by Head of Zeus), combines 25 stories and 25 paintings. Ben Okri has published many books, including The Famished Road, which won the Booker Prize in 1991. His works have been translated into 26 languages. He is a Fellow of the Royal Society of Literature and an honorary fellow of Mansfield College, Oxford. He was awarded an OBE. He was born in Nigeria, and lives in London. His latest books are: Rise Like Lions and The Magic Lamp: Dreams of our Age. The exhibition includes a wonderful selection of some of Rosemary Clunie’s other work, both paintings and prints, textiles, ceramics, stained glass and pen and ink drawings, including some self-portraits and pen and ink portraits of Ben Okri. Rosemary Clunie is printmaker and video artist, as well as painter. Her art training included courses at City Lit, The Slade, City & Guild, the Cass, and London Print Studio. She has exhibited widely since 1991, from Keats House in London to the World Economic Forum in Davos, Switzerland. Her paintings are included in eminent public and private collections. Her prints and some paintings are also available for sale from the Museum exhibition. To find out more about this exhibition and other events at Abergavenny Museum follow the Twitter account and also like the Facebook page for updates.